KYC.co is a due diligence service provider for AML and KYC compliance officers. Powered by network analysis of individuals, companies and web sites to unravel hidden connections between entities for financial institutions, banks and government regulators. Organisations may use shell companies or 'front' companies in order to gain access to payment services such a Visa, MasterCard. KYC help prevent such fraudulent applications! Identity discovery is a process where associates and closely related online entities or individuals associated with them are discovered. This process involves network analysis of the hidden footprint which evolve around online entities. E-commerce payment processing companies have to ensure that the companies who they provide accounts to are actually doing business in the sectors they claim to be operating. For example: a casino which claims to be a garden centre. Our software will detect the link history of the entities being proposed and highlight the associations between interconnecting online entities to ensure authenticity of the domains, company officers and agents. Banks and merchant acquirer compliance departments are required to ensure their accounts are operating within sectors outlined by their payment providers terms and conditions. Processing payments for non supported sectors increases the risks for banks and payment providers for chargebacks, risk of default and card fraud. Existing customers can be audited to ensure they are compliant with KYC requirements set out by payment providers with the next generation of KYC scoring which is derived from digital and real world footprints providing greater accuracy and reducing risks. Our KYC service is ideal as a non invasive low-scale investigation across identity, "know your customer", "anti-money laundering", implementing advanced network analysis techniques. KYC.co integrates across multiple sources of data, bringing together disparate information into a unified report. Our systems take disparate ownership data sources and derive from that data the network and footprint of entities associated historically with the person or entity. Companies who are authentic earn a natural online footprint and link profile over their history, by using in depth data analysis we can uncover hidden relationships within networks that connect entities to their associates which reveal the true size, business nature, and entities involved. We've introduced 'Big Data' concepts into KYC due diligence processes so that decisions can be intuitively easy. 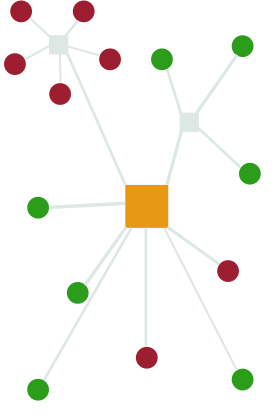 Our Visualisation software can highlight connections that are only possible to uncover through co-citation and bipartite graph analysis. Our KYC service allows organisations to greatly reduce their identity management, KYC, AML, and Compliance costs while providing greater and safer scalability for the entire organisation. The technology we have created has been developed over a ten year history in understanding online web domain authenticity and trust. Modelled on academic research used by Google to understand domain trust in order to ensure their search results are not manipulated. Our technology uses concepts and techniques developed in combatting web spam using Interconnected Networks & Bipartite Graph analysis, to provide better solutions and understanding to KYC challenges. © 2009-2017 KYC.co is wholy owned by TBI Inc. All rights reserved. Termopilas Battle Investments S.A.